As part of the new Harris County Animal Cruelty Taskforce, deputies in Precinct 5 rescued seven pet cats and launched a criminal investigation into the remains of three others discovered inside an abandoned Bear Creek home. Precinct 5 deputies were called on Monday by a neighbor who saw one of the carcasses through a window and noticed a foul odor coming from the home in the 15600 block of Fern Basin. Sgt. Charles Jantzen, who heads up Precinct 5’s Animal Crimes Unit and the new Harris County Animal Cruelty Taskforce, coordinated the safe removal of seven severely malnourished cats. 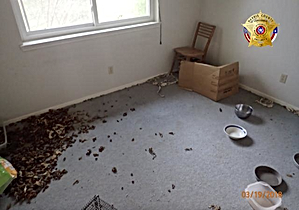 The home’s interior was covered in urine, feces and, in one room, the skeletal remains of another cat. The results of Sgt. 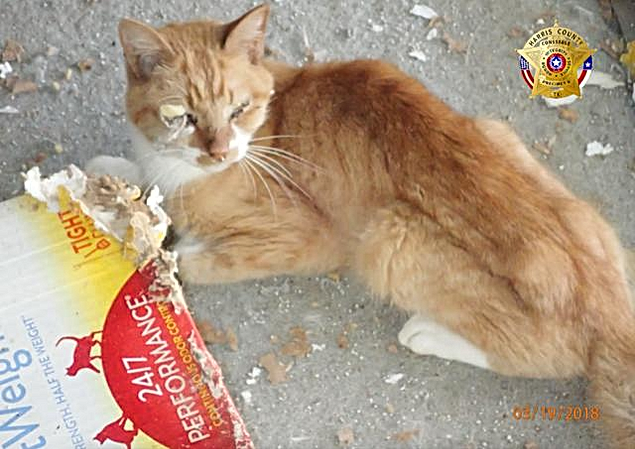 Jantzen’s investigation will be turned over to the Harris County District Attorney’s office to determine whether criminal charges will be filed.The surviving cats are being evaluated by a veterinarian. The Houston Humane Society will take over the recovery process while awaiting a court hearing on their legal custody. Precinct 5 encourages anyone who suspects animal cruelty to report it to the new Harris County Animal Cruelty Taskforce at 927paws.org or 832-927-PAWS.